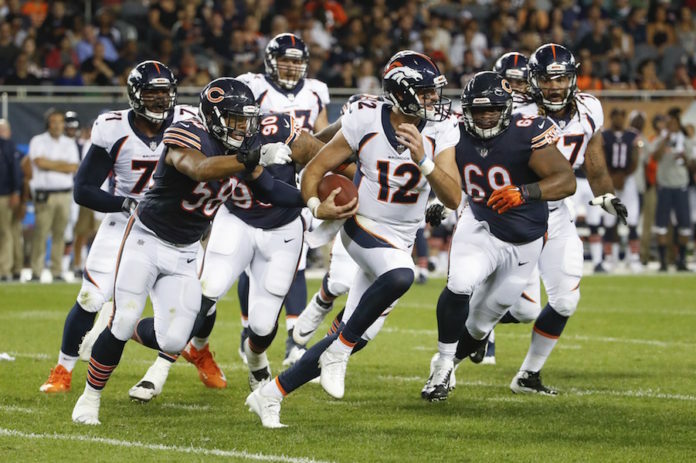 It was clear on Thursday night in the Denver Broncos’ 24-17 victory over the Chicago Bears that John Elway has indeed made some upgrades to his offensive line. It was also clear that several positions among that group are still in need of improvement. Rookie left tackle Garett Bolles looked as good as advertised. 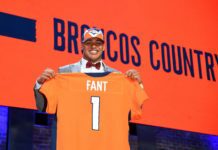 Not only was he solid in pass protection, he was showing leadership qualities on the sideline and even evoked a costly penalty against his opposing defender (an eighth-year veteran, no loess). 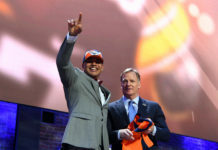 Bolles did have one minor slip up, when he forgot to stay on the field for a Brandon McManus field goal attempt, but otherwise it was a successful debut for the first-round pick. On the right side, however, free-agent tackle Menelik Watson struggled. On Denver’s very first offensive snap, Watson’s man beat him badly off the line and sacked Trevor Siemian for a seven-yard loss. On that same drive, Watson took an illegal use of hands penalty that offset a defensive pass interference play that would have given the Broncos a first down. Free-agent right guard Ron Leary looked every bit as good as advertised in his limited snaps. At left guard, Max Garcia took a holding penalty inside the red zone on third down on the opening drive. He’s in competition with late free-agent signing Allen Barbre, who stayed mostly off the radar on Thursday night – which is always a good thing for a guard. The starting unit did appear stronger in opening up holes against the run, helping C.J. Anderson run for a 4.2 YPC average in his five touches. Stevan Ridley looked productive with the first-teamers, although his time with the second-team distorted his stats a bit. He finished the night with 17 yards on 8 carries. Connor McGovern looked mostly solid starting in place of center Matt Paradis, who is being eased back into things after offseason hip surgery. McGovern did allow a third-down pressure on Trevor Siemian on the opening drive, but looked like he could be a very capable backup behind Siemian. McGovern’s competition for that spot, Dillon Day, did not have a great night. He took a taunting penalty that offset an unnecessary roughness penalty against Chicago, and again took an offsetting penalty on a holding call on the next drive. Donald Stephenson, in competition with Ty Sambrailo for the swing tackle position (assuming Watson holds on to the job on the right side), had a pair of costly plays. He missed a block completely that resulted in a blown up third-down play, and he also took a holding penalty. Penalties were the story of the night for the second- and third-string linemen. Rookie running back De’Angleo Henderson had a pair of big runs called back because of holding before he finally broke one for 41 yards to put Denver on top for good. The run came on a third-and-22, caused by a holding penalty and a sack of Kyle Sloter. Third- and fourth-down short yardage situations were a problem for Denver last season, and proved to be so again on Thursday. On three running plays of third- or fourth-and-short, they converted just once. Pass protection for all three quarterbacks was spotty – Siemian and Sloter were each sacked once and Lynch had to scramble four times – but it did look like Denver is moving in the right direction in the running game. One sack allowed, one penalty (negated by an offsetting penalty) — rough series for Menelik Watson. Bolles had to sprint back onto the field for the FG — had walked back to the sideline after the 3rd down. Rookie mistake there. Third-and-1, where the Broncos were the worst in the NFL last season, creeps up as a problem again. Ridley loses three. Broncos punt. Donald Stephenson completely whiffed on that 3rd-and-1 run. Loving the competition amongst offensive line. Sense of urgency and finish throughout the depth chart is obvious.